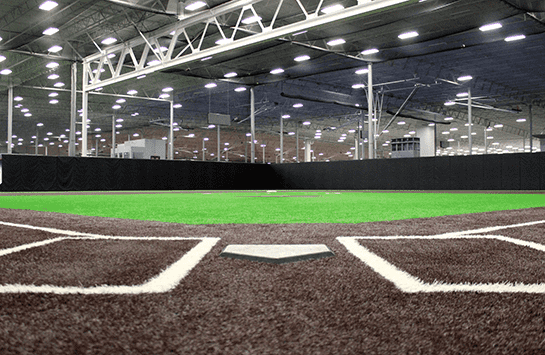 The Spooky Nook Sports Baseball & Softball Center offers fourteen indoor batting cages, three pitching lanes, and our very own diamond – a turf infield with in-ground bases, dugouts, and a mezzanine level for spectators. Field dimensions include 125’ down the left and right field lines, 150’ in center field, and a 15’ padded outfield wall. Spooky Nook Sports creates an energetic atmosphere that encourages competitive fun! Spooky Nook Baseball offers private and small group lessons, beginner and elite level skill specific clinics, summer camps, academy teams, indoor youth baseball tournaments (also including fields in our Field House and Dome), T-ball Leagues and much more. Individual or small group baseball lessons are available at the Nook for athletes of all ages and skill levels. Our coaching staff, with many years of amateur and professional coaching and playing experience, will work with athletes one-on-one. Lessons are available for hitting, fielding, throwing, pitching, catching, or a combination of multiple skills. Lessons are customized to help athletes reach their individual baseball goals. Lesson prices vary per coach and are available for 30 minute or 60 minute time slots. Email baseball@nooksports.com to schedule your lesson today! We have several baseball specific spaces available for team, groups, companies, and individual rentals. You can now book the batting cages/pitching lanes and the small turf (60×120) online! Click here to learn more about rentals.